The Tokyo Gas Group believes that promoting CSR is synonymous with practicing its Management Philosophy and Corporate Action Philosophy and intends to contribute to society through its daily business activities, thereby achieving its public mission and fulfilling its social responsibilities as an energy company. 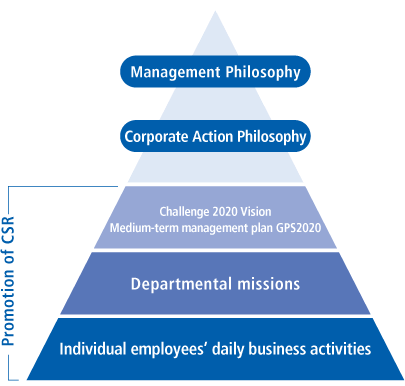 Tokyo Gas Group believes that the foundation of its CSR lies in fulfilling its public mission and social responsibilities by practicing the Management Philosophy and Corporate Action Philosophy in its daily operations. We aspire to achieve continuous corporate growth by winning the unwavering trust of customers, shareholders and society, and we strive to contribute to the sustainable development of society by consistently meeting societal demands and expectations in Japan and abroad while steadfastly tackling social challenges through our business activities. As a leading energy company with focus on natural gas business, the Tokyo Gas Group shall actively contribute to create a pleasant lifestyle and environmentally friendly society, maintain and enhance its trust from our customers, shareholders, and society. We will continue to grow while maintaining awareness of our company’s public mission and social responsibilities. We will provide quality products and services, and always endeavor to improve customer satisfaction. We will hold ourselves to high ethical standards, and fairly and transparently conduct corporate activities while observing both the letter and the spirit of related laws and ordinances. We will contribute to alleviating global environmental problems as a leader in environmental management. We will remain keenly aware of our obligations to be a good corporate citizen and work towards the betterment of society by contributing to community activities. We will pursue continual innovation to promote a cost effective business approach that is both flexible and resilient. We will aspire to build organizations that are based upon the full exercise of and respect for the talents, desires, and creativity of each and every employee. The Tokyo Gas Group strive to achieve its public mission and fulfill its social responsibilities through its daily business activities as the foundation of its CSR. We also seek to maintain the security and safety of people’s lives by providing a stable supply of energy, which is the foundation of daily life and industry, and to play our part in building a sustainable society by supplying energy that excels in terms of both environmental consideration and cost. As for our CSR, we have identified key CSR issues, or materiality, in accordance with standards such as the ISO 26000 international standard on social responsibility and international guidelines on information disclosure such as the GRI Guidelines. We signed the UN Global Compact*1 in March 2016 to add a global perspective to our CSR activities as a responsible member of the international community, and we will work to achieve the Sustainable Development Goals (SDGs)*2 as we elevate our standards of CSR management. A global framework for attaining sustainable growth that consists of 10 principles in the four areas of human rights, labor, environment, and anticorruption. 17 goals and 169 targets to be met by 2030, adopted at the UN Sustainable Development Summit in September 2015. 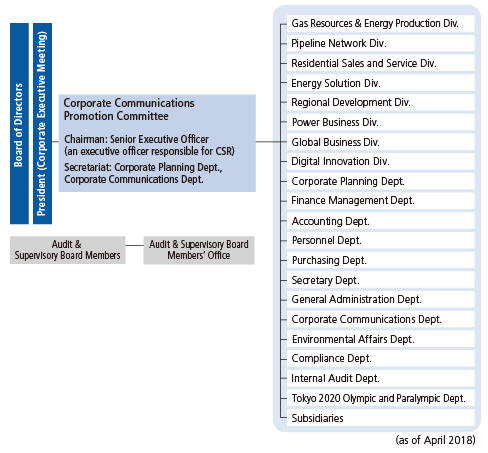 Tokyo Gas established a CSR promotion system in October 2004 by setting up a CSR Promotion Committee chaired by an executive officer responsible for CSR. In December of the same year, the committee was reorganized into the Corporate Communications Promotion Committee under the CSR Section of the Corporate Communications Department. The committee, which is responsible for promoting CSR management, consists of a chairperson and 18 general managers drawn from associated departments. It discusses and shares information on important CSR matters throughout the Group, including the revision of key CSR activities, identification of materiality in light of internal and external changes, and the status of CSR efforts. Committee proceedings are reported to the Corporate Executive Meeting and the Board of Directors for deliberation and authorization as necessary. The Corporate Social Responsibility Section acts as the committee's secretariat to encourage action across the Group to meet society's expectations as determined by public information and consultation activities, such as stakeholder dialogues and publication of CSR reports. It also plans and organizes training sessions to raise awareness and knowledge of good CSR practice while promoting the understanding and realization of our basic CSR policy of serving society through daily business activities to cultivate a shared vision and sense of the Group’s direction among employees. We maintain a keen awareness of the evolving demands and expectations of society to discern the materiality of our CSR activities. In accordance with the direction of our business strategy, we set CSR KPIs and pursue them in the course of our business operations. Progress reports on our CSR initiatives and feedback gathered from stakeholders is then incorporated into our business activities to continue the cycle as our contribution to the sustainable development of society. The Tokyo Gas Group engages in its CSR activities under the basic policy of contributing to the sustainable development of society by consistently meeting societal demands and expectations and steadfastly tackling social challenges through its business operations in Japan and abroad. In March 2016, Tokyo Gas declared its support for the UN Global Compact so that it could pursue CSR management from a global perspective as a responsible member of the international community. We will continue to support and practice the 10 principles in the four fields of human rights, labor, environment, and anti-corruption in our CSR management toward realizing a sustainable society. The UN Global Compact was launched by then UN Secretary-General Kofi Annan at the World Economic Forum in 1999 and officially inaugurated by the United Nations in New York in 2000. As an international initiative designed to achieve “sound globalization” and “sustainable societies,” it calls on companies to implement their business strategies and activities in adherence to 10 principles in the four fields of human rights, labor, environment, and anti-corruption. The UN Sustainable Development Summit held at the United Nations Headquarters in September 2015 was attended by the leaders of more than 150 member states and resulted in the adoption of “Transforming Our World: The 2030 Agenda for Sustainable Development.” This plan of action for people, the planet, and prosperity, consists of a declaration, 17 Sustainable Development Goals (SDGs), and 169 targets that businesses are also expected to sign up for and voluntarily work toward achieving. In light of the adoption of the SDGs, we reviewed the relationship between our business activities and global social challenges and determined our stance on contributing to the SDGs. The Tokyo Gas Group will continue to help tackle the challenges faced by society though its business activities.